A low maintenance composite deck can make a great addition to your home. Why not enhance your outdoor space with a beautifully designed feature that is excellent for entertaining, easy to maintain, and perfect for adding overall curb appeal to your home? If you are looking for a classic design made from both durable and sustainable materials, a composite deck is an excellent choice for your family. Still undecided? Consider these four main benefits of adding a low maintenance composite deck to your home for your family to enjoy this year. A composite deck is a top seller because it offers the same classic look of a wood deck with durable materials. Especially if you already love the look of your home, a deck is a classic outdoor feature. Not only will your deck serve your family and enhance your home, but it will also be appealing to homebuyers, should you look to sell your home in the future. Your composite deck will not require staining or treatments to keep it looking great throughout the year. Because these decks are made primarily of recycled materials, it will not fade, scratch, or come apart over time like traditional wood. These decks are also great for Maryland homes because their durable material allows them to withstand fluctuating temperatures and inclement weather in ways that traditional wood decks cannot. 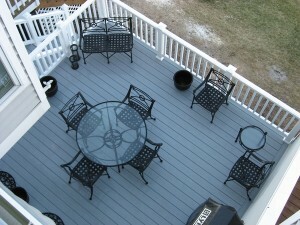 For this reason, composite decks are even more ideal for families who love to entertain outdoors throughout the year. Another point of appeal for a composite deck its the sustainability. With its material derived from recycled products, it offers the same look and feel of a wood deck with less environmental impact. If you are factoring sustainability into your decision, this particular type of deck is the most sustainable option. Once you invest in a composite deck, your investment in durable, high-quality materials will ultimately save you money on otherwise costly maintenance in the future. In selecting this particular type of deck, you are also saving money and stress from potential repairs and seasonal maintenance throughout the year. Ready for a New Deck? Mid-Atlantic Deck & Fence has almost 30 years of experience in building beautiful custom fences, gazebos, screened-in porches, and decks throughout the state of Maryland. We have the expertise to design your dream fence or custom deck and have it installed in a headache-free process. Give us a call at 1-800-833-9310 or visit us online for a quote today! We offer many different styles of fencing and decking in addition to custom options designed specifically to suit your preferences and tastes. To see examples of our work and get more tips on how to choose the right gazebo for your family, follow us on Facebook, Twitter, Houzz, Pinterest, Google+, YouTube, and LinkedIn.